Throughout Monday’s speeches at the convention dozens of Sanders delegates around the arena booed any mention of Hillary Clinton’s name. By the end of the evening, many of those still shouting — including over Sanders’ speech — were in the California seating section. “We must stay focused on the major concerns of the American people and in the process have the guts to say yes, we are going to transform this country,” he said. Sanders said that means working to elect Clinton. 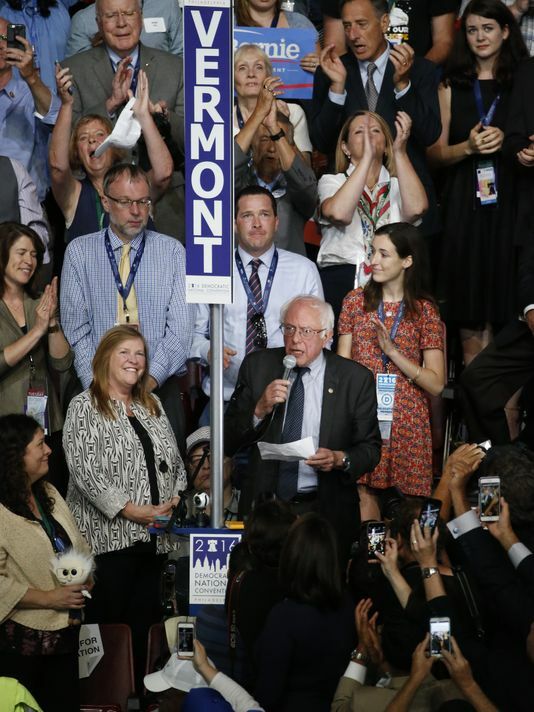 Sanders’ pleading with his delegates appeared to be effective with the vast majority of his delegates during the roll call of the states in the afternoon, which was well managed by both the Clinton and Sanders camps. There were some touching moments during the roll call. Bernie Sander’s brother Larry Sanders got emotional while casting vote for his brother and brought many to tears. Bernie Sanders, who was watching from the gallery, was cheered by all delegates. Arizona delegate Geraldine “Jerry” Emmett, who is 102, born before women gained the right to vote, was given the opportunity to announce Arizona’s votes for Clinton. I have known Jerry for a long time, and I know how much this honor meant to her. “I cried! I never cry,” Emmett said afterward. Born before all women could vote, Prescott woman, 102, reports AZ delegates for Clinton. 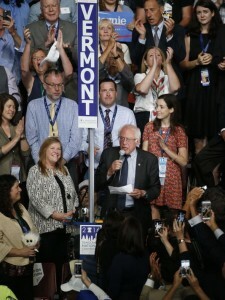 The state of Vermont passed so that it could go last at the end of the roll call. By then, Senator Sanders had joined his state delegation on the floor, and did what Hillary Clinton had done in 2008 for Barack Obama: Sanders was gracious and magnanimous in asking that the rules be suspended and moved for a vote by acclamation. Sanders’s support seals Clinton nomination. The motion was approved by a loud roar (with only a smattering of nays in opposition, and a small number of Bernie or Bust delegates leaving the convention hall for the media tent for attention). It is official: the Democratic Party is the first major political party to nominate a woman as its nominee, eight years after nominating the first African-American nominee. This is an historically significant event no matter whom you supported in the primary. Tuesday’s early speakers were the traditional testimonials, mostly individuals whom Hillary Clinton has known or worked with over many years while working as an advocate for children, women, the disabled, and for health care. Former president Jimmy Carter urged young people to vote, and said he would campaign for the ticket this fall. Many have argued that Donald Trump would harm our national security if he were elected president. The fact is: He has already done damage, just by running for president. He has undermined our fight against ISIS by alienating our Muslim partners. He has weakened our standing in the world by threatening to walk away from our friends and our allies—and by encouraging more countries to get nuclear weapons. Donald Trump also has a strange admiration for dictators such as Saddam Hussein, Kim Jong-un, and Vladimir Putin. When asked about Putin, Donald Trump said—and I quote—”in terms of leadership, he’s getting an ‘A. '” The truth is that a Trump victory in November would be a gift to Vladimir Putin—and given what we have learned about Russia’s recent actions, Putin is eager for Trump to win. And that should worry every American. Take it from someone who fled the Iron Curtain, I know what happens when you give the Russians a green light. Trump’s dark vision of America, one that’s isolated in the world, alienated from our allies, would be a disaster. We must make sure that never happens. We must elect Hillary Clinton as our next president. 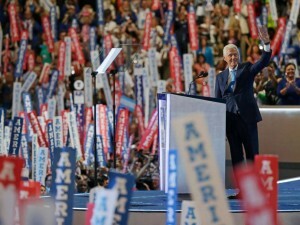 But the “main event” on Tuesday night was former president Bill Clinton. 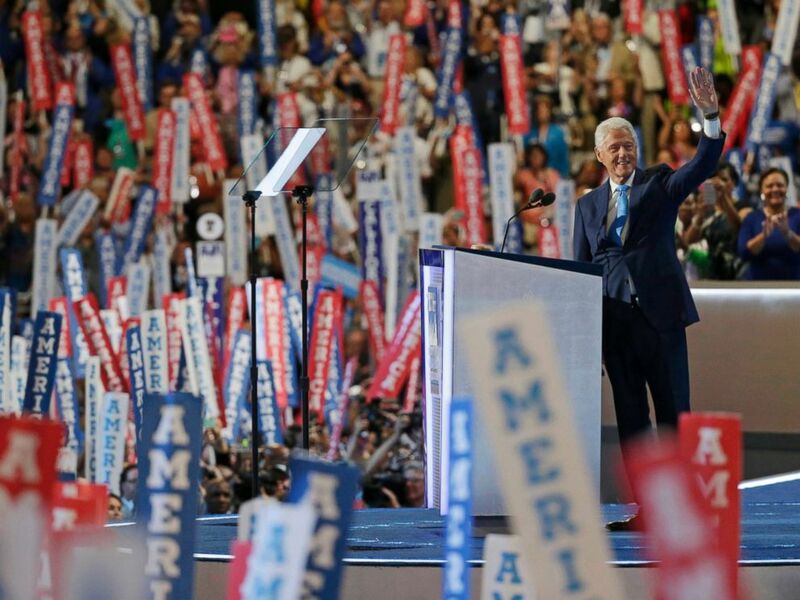 In previous conventions Clinton played the role of “explainer in chief,” but in an historical first, Tuesday night he was delivering the traditional candidate spouse speech. 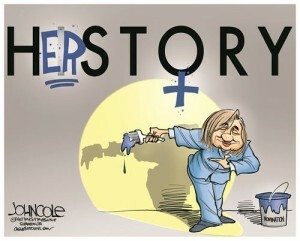 Bill Clinton Offers Personal Tales of Hillary. “The real one had done more positive change-making before she was 30 than many public officials do in a lifetime in office. The real one, if you saw her friend Betsy Ebeling vote for Illinois today has friends from childhood through Arkansas, where she has not lived in more than 20 years, who have gone all across America at their own expense to fight for the person they know. “The real one has earned the loyalty, the respect and the fervent support of people who have worked with her in every stage of her life, including leaders around the world who know her to be able, straightforward and completely trustworthy. “The real one calls you when you’re sick, when your kid’s in trouble or when there’s a death in the family. The real one repeatedly drew praise from prominent Republicans when she was a senator and secretary of state. Hillary Clinton appeared by video to thank the delegates for their nomination with a “breaking glass ceiling” motif, and said she would speak Thursday night. Actress Meryl Streep gave a wild scream that fired up the delegates before giving her speech. Meryl Streep’s speech at the Democratic convention. Alicia Keys did a set singing ‘Superwoman’. And a host of Celebrities performed ‘Fight Song’ in a video for the Clinton campaign. This was the “infomercial” for a unified Democratic Party that conventions are meant to provide. I’ve finally figured out why Trump hasn’t released his tax returns. He paid his taxes in rubles. I almost cried when e-mails told me clinton campaign and d.n.c. was paying blogers and tweeters to promote clinton and trash bernie. jill stein green party will be their next victim. It’s already started, Cap, I just finished a long read on why Stein’s platform is nonsense. There were a few good points, but most of the article was just the same old same old about how we’ll never get anything progressive done in the current political environment so why bother. These pundits don’t seem to get that the reason to elect Stein would be to change the current political environment so we can get some good things done. My how the establishment does rationalize their own existence. as compare to what? 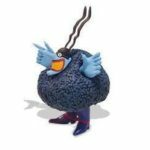 dnc and hillary campaign paid democratic trolls going after bernie supporters?